Home > Google News > Misc Google > What Does a Google Malware Warning Look Like in Webmaster Tools? It is not uncommon to see websites infected with malware. In fact, I see more and more cases of sites being removed or warned by Google for containing traces malware. Sites being hacked is way too common these days. Many of you have not experienced the consequences of a site hack. I have with Jennifer Convertibles and honestly, it was invaluable experience to deal with first hand. In a Google Groups thread, JohnMu of Google, posted a screen shot of what a Google Malware warning would look like in Webmaster Tools. I have never seen such a warning posted before, or at least, I don't remember seeing a screen shot of a warning posted before - so I thought I share it with you all. So, as you can see, the warning is served up directly on the overview page of Webmaster Tools. It is a big, huge warning, which you should not miss. This is one major reason (there are others) why you should verify your site with Google Webmaster Tools and check it regularly. 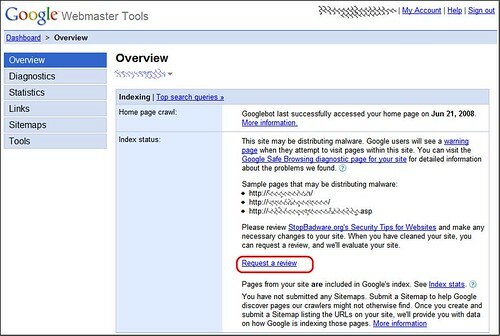 Google began showing malware warnings in Webmaster Tools just about a year ago. But they have been offering warnings via email way before that. Previous story: Does Google Conduct Minor Toolbar PageRank Updates Between Major Updates?